Kendall’s Concordance Coefficient W is a number between 0 and 1 that indicates interrater agreement. So let's say we had 5 people rank 6 different beers as shown below. We obviously want to know which beer is best, right? But could we also quantify how much these raters agree with each other? Kendall’s W does just that. Let's consider the 2 hypothetical situations depicted below: perfect agreement and perfect disagreement among our raters. I invite you to stare at it and think for a minute. As we see, the extent to which raters agree is indicated by the extent to which the column totals differ. We can express the extent to which numbers differ as a number: the variance or standard deviation. As a result, Kendall’s W is always between 0 and 1. For instance, our perfect disagreement example has W = 0; because all column totals are equal, their variance is zero. 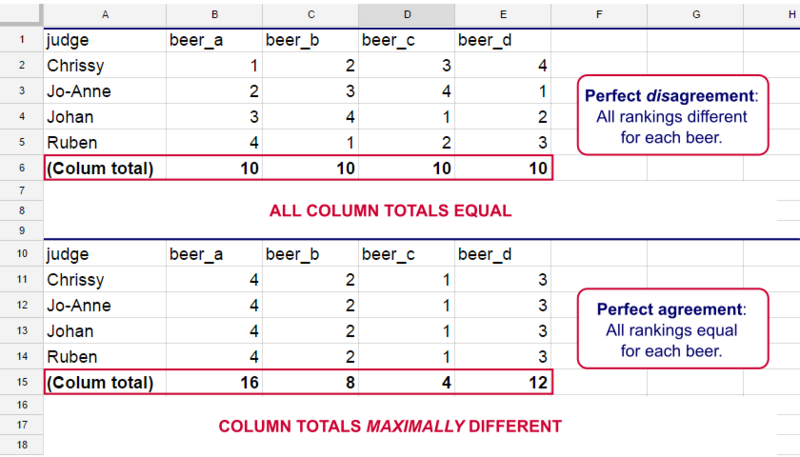 Our perfect agreement example has W = 1 because the variance among column totals is equal to the maximal possible variance. No matter how you rearrange the rankings, you can't possibly increase this variance any further. Don't believe me? Give it a go then. So what about our actual beer data? We'll quickly find out with SPSS. We'll get Kendall’s W from SPSS’ Nonparametric Tests menu. The screenshots below walk you through. Note: SPSS thinks our rankings are nominal variables. This is because they contain few distinct values. Fortunately, this won't interfere with the current analysis. Completing these steps results in the syntax below. *Kendall's W from nonparametric tests - legacy dialogs - k related samples. And there we have it: Kendall’s W = 0.78. Our beer judges agree with each other to a reasonable but not super high extent. Note that we also get a table with the (column) mean ranks that tells us which beer was rated most favorably. We'll verify this by running and averaging all possible Spearman correlations in SPSS. We'll leave that for a next tutorial, however, as doing so properly requires some highly unusual -but interesting- syntax. Howell, D.C. (2002). Statistical Methods for Psychology (5th ed.). Pacific Grove CA: Duxbury. Slotboom, A. (1987). Statistiek in woorden [Statistics in words]. Groningen: Wolters-Noordhoff. Previous tutorial: Cramér’s V – What and Why? The tutorial is easy to understand and apply. Thanks a lot. To find all the places where a particular statistic might appear, it is better to search the Algorithms manual rather than the CSR, which doesn't generally provide a complete list of the output from a procedure. Thanks Jon, that's a great suggestion and I'll modify the tutorial accordingly! I searched (ctrl + f) the CSR for Kendall and only RELIABILITY came up, hence the approach taken. I must have overlooked NPAR TESTS (or I'll just blame Acrobat Reader for that). I was a bit surprised that Kendall's W wouldn't be calculated even though there wasn't anything in the way of doing so. But using NPAR TESTS -indeed- is a way better option altogether. Thanks again for another great contribution, I highly appreciate it! npar tests kendall=beer_a to beer_f. The zero variance problem in Reliability is not specifically due to the Kendall calculation.